Vishnu is one of the major deities in Hinduism and is worshipped across the globe. He is generally known as the protector of the world and forms the Hindu Trinity along with Lord Shiva and Lord Brahma. Being one of the oldest inhabited regions in the country, Karnataka is known for its rich culture and heritage. Therefore, you can find several age-old and recently constructed temples dedicated to Lord Vishnu within its boundaries. So, if you are keen on learning about spiritualism and the importance of Lord Vishnu in Karnataka, following are the temples you must visit. Read on to know more about their location, history and religious prominence. Built atop a small rocky hill at a distance of about 50 km from Mysore, Cheluvanarayana Swamy Temple is located at Melukote and is one of the most significant temples in the region. It is not only known for its religious importance but also for its architectural beauty. Yes, the temple boasts of beautiful designs, intricate patterns and lovely carvings. As per historical records, the temple is said to have been established in between the 16th and 17th century. However, the legends of the temple being built by the Lord himself are also popular amongst locals. 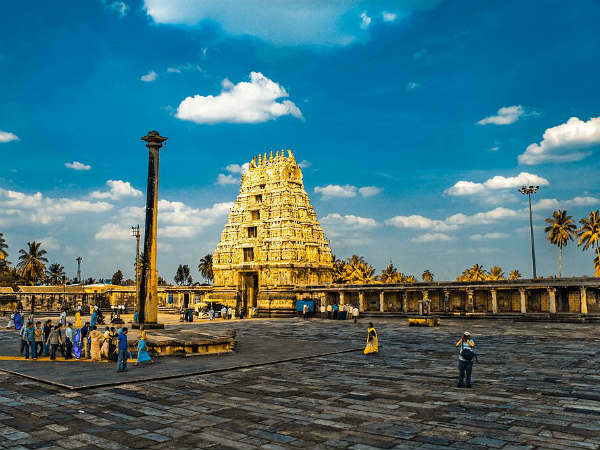 One of the most important pilgrimage sites amongst Vaishnavites along the Kaveri river, Ranganathaswamy Temple is located in the historic town of Srirangapatna and was built during the reign of the Western Ganga dynasty. Today, the temple is still standing strong and allures thousands of Hindu devotees and tourists every year. After all, it is one of the must-visit destinations in Srirangapatna. Apart from savouring its pristine and divine aura, you can also indulge in exploring the commendable architecture of the temple. From stone carvings to beautiful designs, each and every corner of the temple deserves to be captured. One of the few Vishnu temples which are frequented by people of all castes, creeds and religions, Chennakeshava Temple is a 12th-century temple and was built during the rule of the Hoysala Empire. Today, it is visited by people from all over the state. The use of scenes and texts from the Mahabharata and the Ramayana over the walls and the pillars of the temple is definitely remarkable. If there is any Vishnu temple in Karnataka which no traveller can afford to miss visiting, then it is certainly the Chennakeshava Temple at Belur. It is one of the few places where you can literally feel the essence of divinity in the air. Another Vishnu temple in Karnataka which is more of an architectural beauty rather than being a site of great religious importance, Vitthala Temple is one of the prominent attractions in Hampi. The temple was built in the Dravidian style of architecture in the 15th century when the region was the capital of the Vijayanagara Empire. Therefore, it has also been one of the highly revered sites amongst Hindus. Even though the temple is mostly visited by history lovers today, it certainly harbours a serene and an unearthly aura that is left unexplored. Located at a distance of about 40 km from Udupi, Ananthashayana Temple was once a Jain basadi in the 15th century. Later on, it was converted into a temple after Sri Narasimha Bharati Swamiji, a great spiritual guru, visited the king of the region and demanded a Lord Vishnu temple for his stay in the kingdom. Today, the temple is under the care of the Archaeological Survey of India and is visited by hundreds of tourists from all over the district. Don't you think you must catch a glimpse of this historic site and explore its detailed history this season?